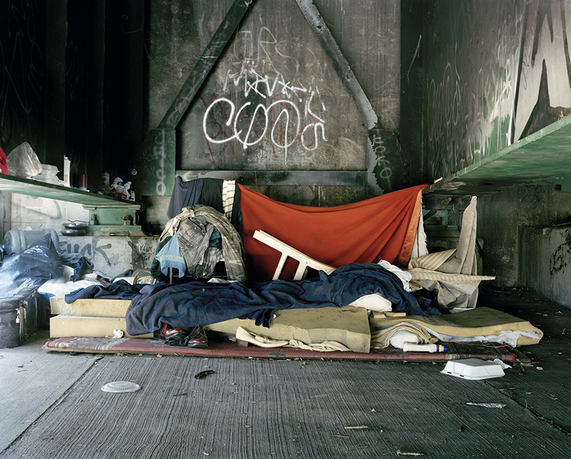 Homes of the American Dispossessed is a series of large-format photographs of temporary makeshift dwellings and habitats created by homeless people living in the West Coast States of California and Nevada. 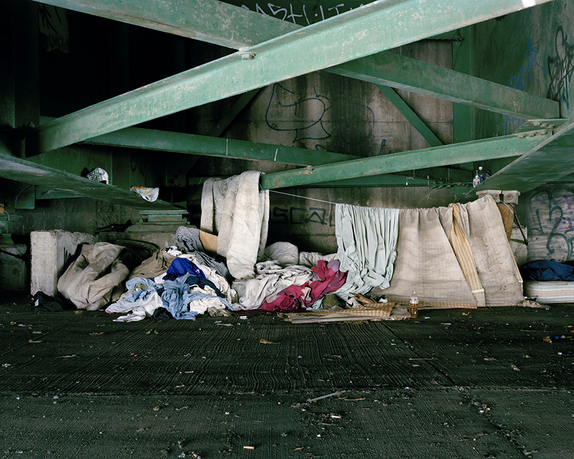 Ben Murphy's work considers the values and identities of those excluded from conventional society, through visual documentation of their built environment. 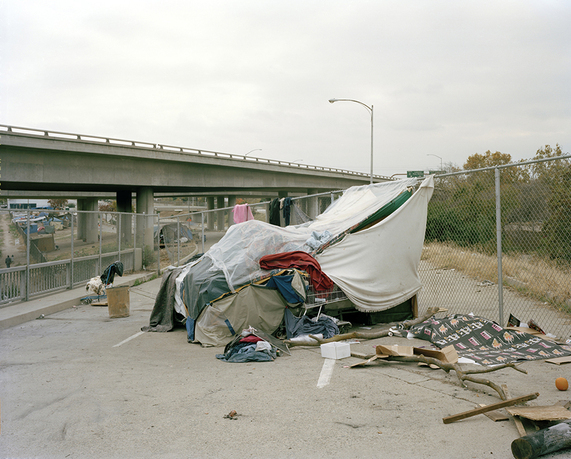 By adapting prefabricated tents and also creating improvised makeshift structures, given limited resources in unstable situations, people create homes, personal space, territory, and identity. Murphy explores some of the tensions and paradoxes within American society concerning the concept of freedom, and the ideology behind the American dream. 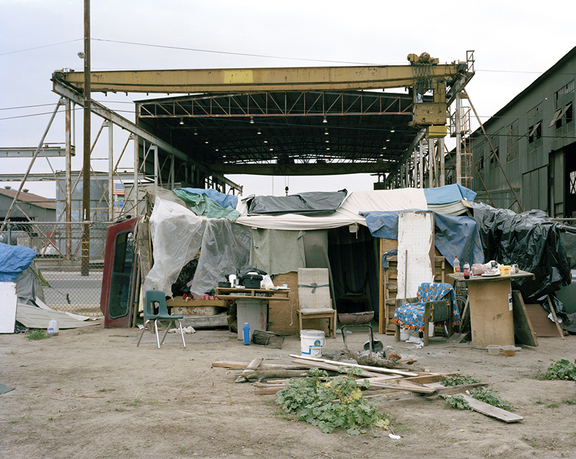 In a wider context, the work reflects on similarities between the architecture of these communities and migrant encampments during the Great Depression in 1930s America, and in the African and Asian subcontinents. Murphy intends to initiate critical debate about how "home" is constructed and identity asserted through temporary, self-made architecture. Ben Murphy worked as assistant designer to the world-renowned graphic designer Neville Brody, and assistant art director at Face before becoming a photographer. His current practice involves initiating work for exhibition and publication, and fulfilling commissions for major magazines in the UK and abroad, such as Wallpaper*, Nowness.com, Italian Vogue, The Telegraph Magazine. Twelve of his photographs have been exhibited in the National Portrait Gallery, London, and are held in their permanent collections. Recent portrait work has been exhibited at Plymouth Art Gallery and Museum and Sunderland Art Gallery, UK. The Victoria and Albert Museum in London exhibited works from Murphy's series The Riverbed in 2008, and are also in their permanent collections. This series concerned the self-made, temporary dwellings of nomadic British counter cultures in Southeast Spain and was nominated by the Photographers' Gallery, London, for the European Sovereign Art Prize, for which it was subsequently shortlisted. Murphy's work also featured in the art photojournal Portfolio, as well as in the Antwerp Fotomuseum's art magazine Extra. Murphy's book The U.N. Building (Thames and Hudson/Norton USA, 2005) explored the interior spaces and exteriors of the United Nations Building in New York and the relationship between the building and its environment. His work is also published in the book American Glamour and the Evolution of Modern Architecture (Yale University Press 2010). 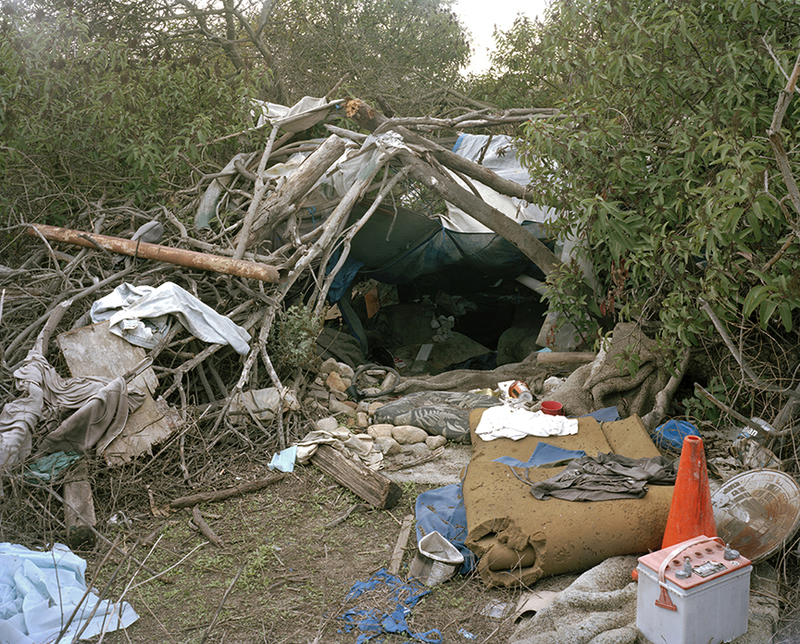 Murphy is currently undertaking a practice-based PhD in photography at University of the Arts, London, for which he is continuing to research migrant countercultures in Spain.